Achieving the perfect look is easy with Duncan® E-Z Stroke® Translucent Underglazes! 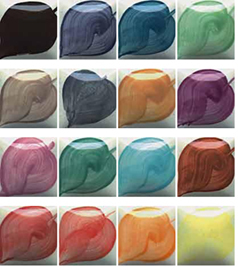 Their intense pigment allows for high definition and decoration on your pieces. Create a watercolor effect with one simple stroke or add shading and depth with additional strokes. E-Z Stroke Underglazes are ideal for airbrushing, antiquing and brushwork. They can be applied directly to greenware or bisque and layered over most underglazes, allowing the basecoat to show through. They’re safe for serving food when coated with a Duncan food-safe clear glaze.